This is a blog about perspective, about how I see the world. It is about returning the gaze that is so often turned towards me. To be a dwarf is to live in the limelight, the spotlight; to be a spectacle. What do I hope to offer the dear reader? A change in perspective. In the tradition of Gulliver, whose experience amongst the diminutive Lilliputians leaves him bemused and beffudled, and somewhat self-righteous in light of their pettiness, I will reverse the gaze. In the vein of Gulliver’s post-Lilliputian voyage to Brobdingnag, where he becomes the ridiculed, the spectacle, the object of the examining gaze, – a dwarf among giants – I am offering my Lilliputian view. 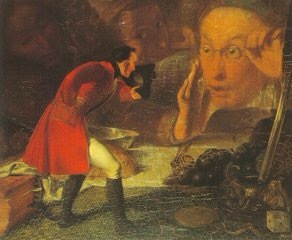 “Szene aus Gulliver’s Reisen – Gulliver in Brobdingnag” by Richard Redgrave – Victoria and Albert Museum, London. You see, I believe that my world view is inextricably linked to the experiences I have had and continue to have in Lilliput. Though my topics may not always be about disability, or dwarfism, or even spectacle, my gaze on the world is informed by these. These make up the multifaceted prism through which I reflect the world back at you. As I interact with the world, – read, listen, watch – my own experiences as “other” necessarily influence my perspective. Though, unlike Gulliver, I have lived my whole existence in Brobdingnag. I have never been a giant among dwarfs, but like Jonathan Swift, I do hope my writing will offer a new (relative) perspective, a new gaze, a new view on your world. This is how the world of Brobdingnag looks from Lilliput. One more point on the title: the fancy Latin. In this I owe a debt to my liberal education. Once upon a time, in college, I took two years of Latin and learned about such things as declensions. I learned that the feminine singular genitive of minuta is minutae, meaning “of a small thing.” In a similar vein, minutiae is the genitive of minutia, or “of smallness.” This is the game I’ve played with the name Lilliput. Lilliputia = things relating to Lilliput (i.e. small things). Lilliputiae = of things about Lilliputia. See what I did there? Clever. The other part of my liberal undergrad (and grad) education involved the reading of many philosophical essays by none other than Michel de Montaigne. This lovely man would write essays and title them things like “des Cannibales” (“Of Cannibals“), or in other words: all about cannibals. See, Montaigne used this clever French genitive to talk about things pertaining to “cannibals” (or whatever). Except for that most of Montaigne’s essays are not actually about what the titles say they’re about. There aren’t really that many cannibals in this essay, except for that he’s talking about relative morality. Who is the true savage? The cannibal or the European? Who is the dwarf? The Lilliputians or Gulliver? See what I did there? Clever. One last thing. The title of this blog is also meant to be subversive in the sense that I hope to reappropriate some negative associations that the community of people with short stature might have with “short worlds.” Back in the heyday of Cony Island’s Dreamland, there was a place called Lilliputia, or “Midget City,” a miniature city where 300 dwarfs lived as a spectacle. Lilliputiae is also then a response to this Lilliputia. This is what I think of the “tall world.” I am not rendering it a spectacle, but it is under my microscope nonetheless. 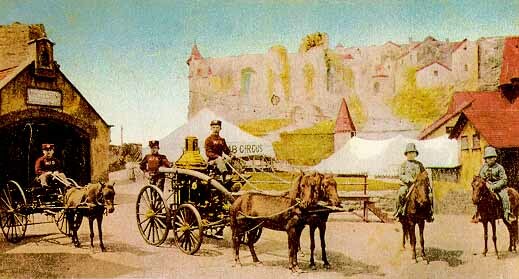 Dreamland’s Lilliputia had its own Midget Fire Department.